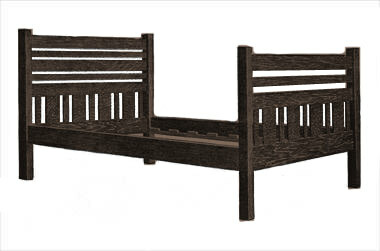 Build a classic mission style bed with free plans. This bed is a simple design yet has class and comfort. Click here for detailed Mission bed plans. The accompanying sketches show an artistic design for a mission bed that is simple in construction and design. It is best made of quarter-sawed oak, as this wood is the easiest to procure and work up and looks well with any finish. If the stock is ordered from the mill ready cut to length, squared and sanded, much of the hard labor will be saved. 2 posts, 2-1/2 by 2-1/2 by 50 in. 2 posts, 2-1/2 by 2-1/2 by 44 in. 2 end rails, 1 by 6 by 56 in. 2 side rails, 1 by 6 by 78 in. 5 end rails, 1 by 4 by 56 in. 3 end rails, 1 by 2 by 56 in. 8 vertical slats, 3/8 by 6 by 11-1/2 in. 10 vertical slats, 3/8 by 2 by 11-1/2 in. 2 cleats, 1 by 1 by 78 in. 5 slats, 3/4 by 3 by 55-1/2 in. 20 blocks, 1 by 1 by 3 in. Square up the four posts in pairs and lay out the mortises as per drawing. To do this, lay them side by side on a flat surface with the ends square and mark them with a try-square. The tenons on the end rails are laid out in the same manner as the posts. Four of the end rails should be marked and mortises cut for the upright slats as shown in the detail drawing. The tenons on the end rails are about 1 in. long, while those on the slats can be 3/4 in. long. Fit all the parts together before gluing to see that they fit square and tight. After the glue has been applied clamp them together perfectly square and set them away to dry. They should dry at least twenty-four hours before the clamps are removed. While the ends are drying, the side rails can be made. These have a 1-in. square cleat screwed to the inner side for the slats to rest upon. If springs are used, five slats will be sufficient. They can be placed where the springs will rest upon them. After the position of the slats has been located, nail small blocks at their sides to hold them in place. For fastening the side rails to the posts, patent devices can be purchased at a local hardware store. The posts will have to be mortised to receive these, and care should be exercised to get them in the right place. When the bed is complete go over it carefully and scrape all the surplus glue from about the joints, as the finish will not take where there is any glue. Remove all rough spots with fine sandpaper; then apply the stain.